For years, there was a ban that prevented truck drivers with diabetes who used insulin from driving commercial vehicles within interstate operation. However, in 2003, the FMCSA introduced the Diabetes Exemption Program which allowed individuals with insulin treated diabetes the ability to operate a CMV in interstate commerce. Diabetes is a disorder that affects the way the body uses digested food for growth and energy. Most of the food people eat is broken down into glucose, the form of sugar in the blood. Glucose is the main source of fuel for the body. As truck drivers with diabetes we will only be concerned about type 1 and type 2 diabetes here. People with Type 1 diabetes are completely unable to produce insulin. Type 1 most often occurs before age 30, but may strike at any age. People with Type 2 diabetes can produce insulin, but their cells don't respond to it. Type 2 usually occurs in adults over 35 years old, but can affect anyone, including children. In either case, the glucose can't move into the cells and blood glucose levels can become high. Over time, these high glucose levels can cause serious complications. At present, scientists do not know exactly what causes the body’s immune system to attack the beta cells, but they believe that autoimmune, genetic, and environmental factors, possibly viruses, are involved. The most common form of diabetes is type 2 diabetes. About 90 to 95 percent of people with diabetes have type 2. This form of diabetes is most often associated with older age, obesity, family history of diabetes, previous history of gestational diabetes, physical inactivity, and certain eccentricities. About 80 percent of people with type 2 diabetes are overweight. 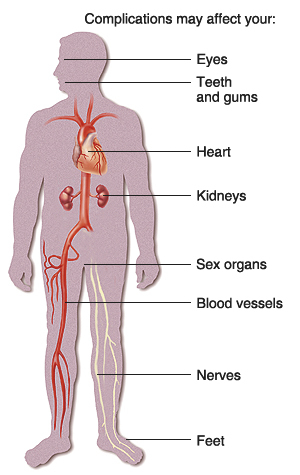 The symptoms of type 2 diabetes develop gradually. Their onset is not as sudden as in type 1 diabetes. Symptoms may include fatigue, frequent urination, increased thirst and hunger, weight loss, blurred vision, and slow healing of wounds or sores. Some people have no symptoms. Type 2 diabetes is more common in older people, especially in people who are overweight. Diabetes is not contagious. People cannot “catch” it from each other. However, certain factors can increase the risk of developing diabetes. Such as being overweight. There seems to be some confusion on whether or not truck drivers with diabetes and use insulin can obtain a CDL license. In 2003, the FMCSA introduced the Diabetes Exemption Program which allowed individuals with insulin treated diabetes the ability to operate a CMV in interstate commerce. But there was a lot of confusion as to who could drive. You had to have three previous commercial driving experience. In late 2005, everything changed. Due to the effort by the American Diabetes Association, a law was passed doing away with the three year requirement. There is no longer any need to show previous commercial driving experience, even if you are on insulin. However, there still are 57 other screenings, guidelines and provisions that one must pass in order to be granted the exemption for truck drivers with diabetes. You must also abide by any particular state requirements in regards to the commercial driver license. Truck drivers with diabetes treated with insulin will have to demonstrate that they have control of the diabetes while on insulin. For those with Type 1 diabetes, they are required to have been on insulin for two months before they can apply for the exemption. Individuals with Type 2 diabetes are required to have been on insulin for at least one month. As you can see, one or two months is much better than the three year driving rule! If you have type 2 diabetes and do not use insulin, you do not need to apply for a diabetes exemption. You must still meet all other licensing and safety requirements as dictated by the state agency that issues your CDL. If you are a truck drivers with diabetes who use insulin to treat your type 2 diabetes, or if you are switching to insulin, you will need to apply for a diabetes exemption if you wish to operate a commercial vehicle in interstate commerce. The application requires that you be evaluated by an endocrinologist and an ophthalmologist or optometrist, and that these doctors provide certain information about your diabetes. You or your doctor may also need to provide other information as requested by the agency. By law, FMCSA must either grant or deny an exemption within 180 days of receiving an application. However, it sometimes takes longer than 180 days if an application is incomplete or the agency requests additional information. ***If you are asked to provide duplicate information, or receive requests to provide additional test results, provide the requested information and results to the agency and call 1-800-DIABETES. Once the agency has made a tentative decision about your application, it will publish a notice in the Federal Register giving the public 30 days to comment on your application, and then issue a final determination. You will receive written notice of the agency's decision. If you are granted an exemption, you will receive written information from the FMCSA about the requirements during the two-year exemption period. Under the law passed by Congress, FMCSA’s new rule will require that truck drivers with diabetes with insulin-treated diabetes demonstrate stable control of diabetes while on insulin. Individuals who have type 1 diabetes will need to have been on insulin for two months before they are eligible to apply for an exemption, and individuals with type 2 diabetes will have had to have been on insulin for one month. Truck drivers with diabetes who are granted a diabetes exemption will need to meet certain safety and medical screening requirements, operating guidelines, and monitoring and accountability standards. Obesity and Diabetes is slowly becoming the number 1 Killer in silent Diseases,along with Heart Disease and Sleep Disorders, especially in the trucking industry. Most all of us do not eat right, get the proper sleep, and are under a lot of stress. Then we spend hour after hour sitting in the seat. This puts a strain on our legs and our blood circulation. Being overweight or obese significantly increases your risk for pre-diabetes and diabetes. Eating a healthy diet and following a regular workout plan can help bring down your weight. Please visit our sponsor below by clicking on the banner. Exercise can help you peel off pounds and maintain a healthy weight. It can also help you shed abdominal fat which increases the risk for diabetes, heart disease and other illnesses. Finally, it makes the body less insulin-resistant. Insulin resistance is a common cause of diabetes. Whole grains contain more fiber than refined grains. This helps damper hunger, and keeps the blood sugar levels more stable. Whole grains take longer for the body to break down, so you get a much slower and less severe blood sugar spike.